Orthopedic Surgeons Negotiate Your Network Contracts for Higher Reimbursements. BillingParadise is hosting a webinar on contract negotiation strategies. 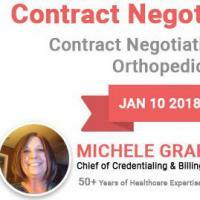 Hosted by popular credentialing and contract negotiation expert Michele Graham on 10.1.2018. Register now. As we are all aware, fee schedules from network payors appear to be going down instead of up. Very few insurance companies attach an actual fee schedule to a proposed contract to a healthcare provider. b. Provider bills $160.00 for this procedure. c. Reimbursement is 80% of RVU, which has a reimbursement rate of $87.70, leaving the patient owing $21.92 , or the amount to be paid by the patient’s secondary insurance carrier. An alternative to going over every code to determine what you will be paid is to list your top 25 codes and email to each carrier for their allowable payment amount. The insurance carrier has 30 days to return this information to the biller or the provider. This is where negotiation of a more acceptable reimbursement comes in to play. Once the contract is reviewed, you or your credentialer, can go back to the insurance contractor and request an increase in the percentage of RVU. Depending on the provider specialty would determine how much of an increase to request. The request for a higher reimbursement may involve several emails back and forth, and even explanations on why the provider should receive a higher reimbursement (years of practicing, knowledge, specialty, etc), but if the percentages are so low that it tightens your budget to an amount you can’t live with, you need to try at least to negotiate a better deal for you and your practice. Usually, a provider has to be contracted for one year before asking for an increase. After the first year, the carrier can evaluate how many claims you are running through their system, dollar amounts, referrals, etc. This is part of what they base a renegotiation fee increase. Specialties like Orthopedics, Cardiology, Pain Management, Neurology, Ophthalmology, Gastroenterology, etc., can negotiate stronger contracts in the beginning based on the reimbursement they are receiving from similar payors.